A three-dimensional computational fluid dynamics (CFD) method has been developed to simulate the flow in a pumping left ventricle. 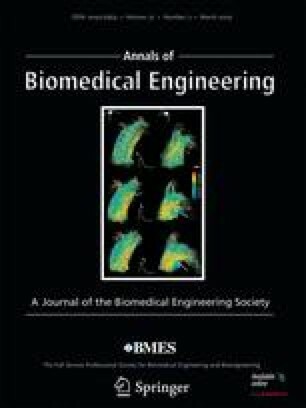 The proposed method uses magnetic resonance imaging (MRI) technology to provide a patient specific, time dependent geometry of the ventricle to be simulated. Standard clinical imaging procedures were used in this study. A two-dimensional time-dependent orifice representation of the heart valves was used. The location and size of the valves is estimated based on additional long axis images through the valves. A semi-automatic grid generator was created to generate the calculation grid. Since the time resolution of the MR scans does not fit the requirements of the CFD calculations a third order bezier approximation scheme was developed to realize a smooth wall boundary and grid movement. The calculation was performed by a Navier–Stokes solver using the arbitrary Lagrange–Euler (ALE) formulation. Results show that during diastole, blood flow through the mitral valve forms an asymmetric jet, leading to an asymmetric development of the initial vortex ring. These flow features are in reasonable agreement with in vivo measurements but also show an extremely high sensitivity to the boundary conditions imposed at the inflow. Changes in the atrial representation severely alter the resulting flow field. These shortcomings will have to be addressed in further studies, possibly by inclusion of the real atrial geometry, and imply additional requirements for the clinical imaging processes. The authors wish to thank all undergraduate, graduate and Ph.D. students that helped in developing the KaHMo. Especially we wish to thank Kathrin Spiegel who greatly simplified the tedious task of grid generation and Ron Schwarz from Fraunhofer FIT for the segmentation work.